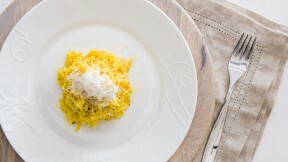 Spice up your vegetable dish by making this spaghetti squash inspired by the classic Roman dish cacio e pepe. (Recipe Credit: Marc Matsumoto of Fresh Tastes. Preheat your oven to 375 degrees F and line a baking sheet with parchment paper or a silicone mat. Slice the spaghetti squash in half and then use a spoon to scoop out the seeds and pith from center of the squash. Split 1 tablespoon of olive oil between the two halves, pouring most of it on the cut edges and spreading it around. Place the squash cut-side down on the prepared baking sheet and then put the sheet pan in the oven. Bake until the squash is tender, about 1 hour. Place 2 tablespoons of butter in a bowl and let it come to room temperature while the squash bakes. When the squash is done, let it cool enough to handle, but is still hot. Use a fork to shred the squash into long strands from side to side. Toss the squash with the butter, Parmigiano-Reggiano, Pecorino Romano, salt and pepper until it is evenly coated. Adjust the salt and pepper to taste and serve.